In our childhood, one of the first recognizable symbols of love before we could read and write were hearts. 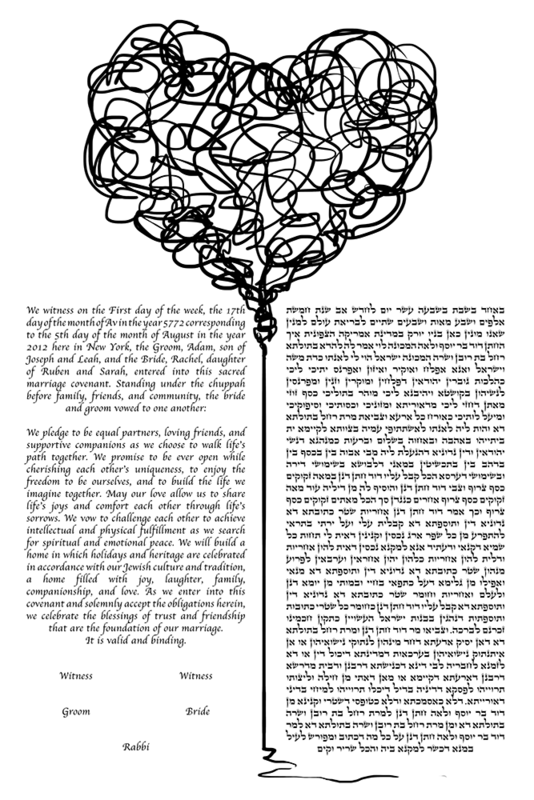 The ketubah features a balloon shaped in the universal sign of love and affection. The neat scribbles depict the chaos and disorder within, while the heart remains firmly tethered to the ground. The absence of a background draws focus to what’s important: the emotion the heart screams out and the ketubah’s sacred words featured below. The minimalist ketubah is perfect for couples who cut out the clutter and focus on what’s important. The ketubah speaks only word and that’s ‘love’. Newlyweds-to-be whom have decided to embark on this mission with only one emotion in mind will love the simple message contained in this ketubah. The mess and disorder is enclosed in a heart of love grounded firmly in reality. The Black Heart String Ketubah is part of our Heart String Ketubah. Please see the series page to see the same ketubah in different colours.